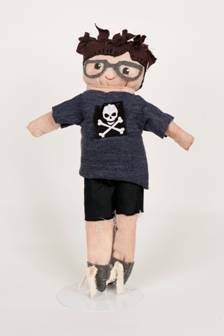 In this BRAND NEW 2 part sewing class, you’ll learn to make a huggable boy or girl doll and you can choose the hair, skin and features! 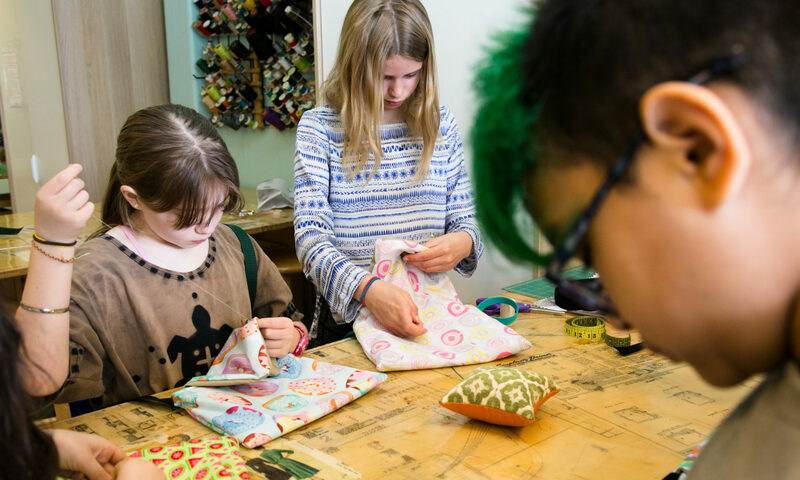 Open to stitchers ages 9 & up, as well as adults of all ages! 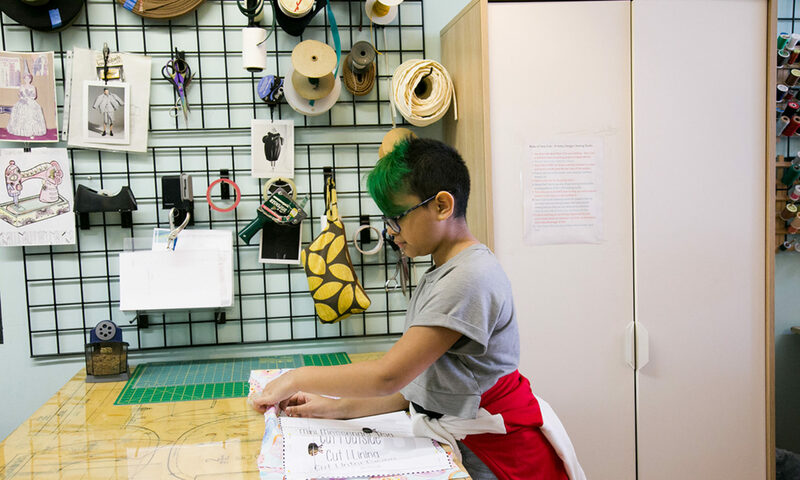 Ellen Lumpkin Brown, Fashion Lab Instructor will show you how. Part 2: Construction of the limbs & attaching them to doll body. Designing the face and creating the clothing. 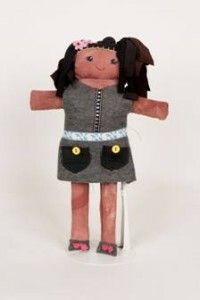 You leave second class with your finished doll! 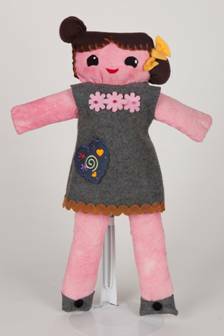 To see more of Ellen’s doll designs, visitwww.TheDollLoft.com. 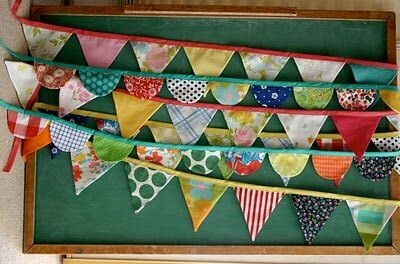 There’s nothing more festive than bunting. 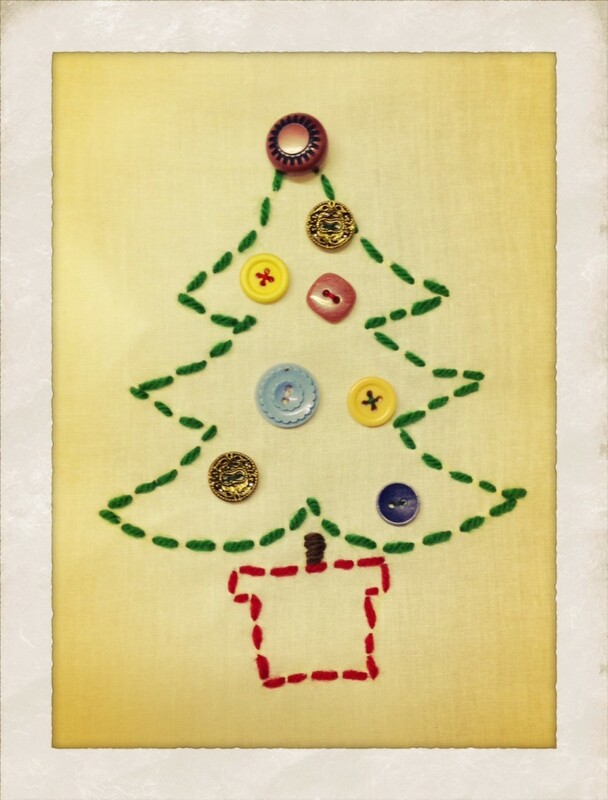 We’ll teach you how to make this simple sewing project just in time for the holidays. 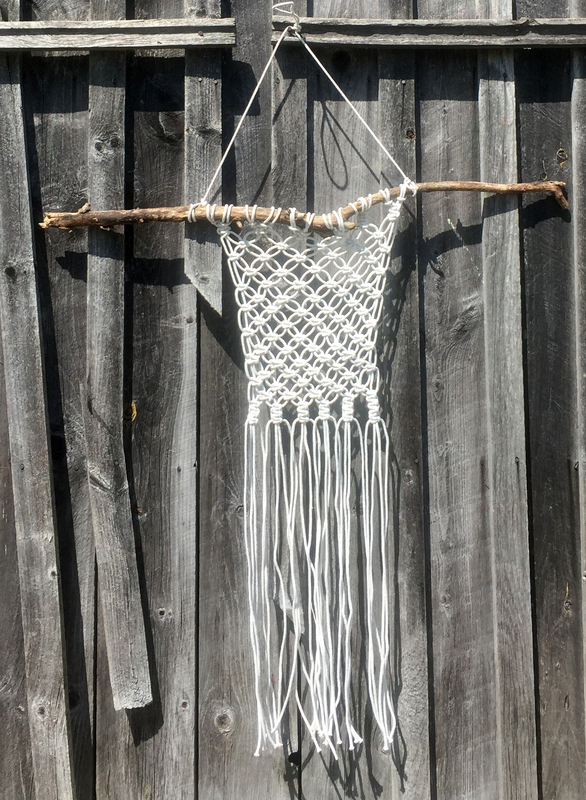 This project is perfect for beginner stitchers. 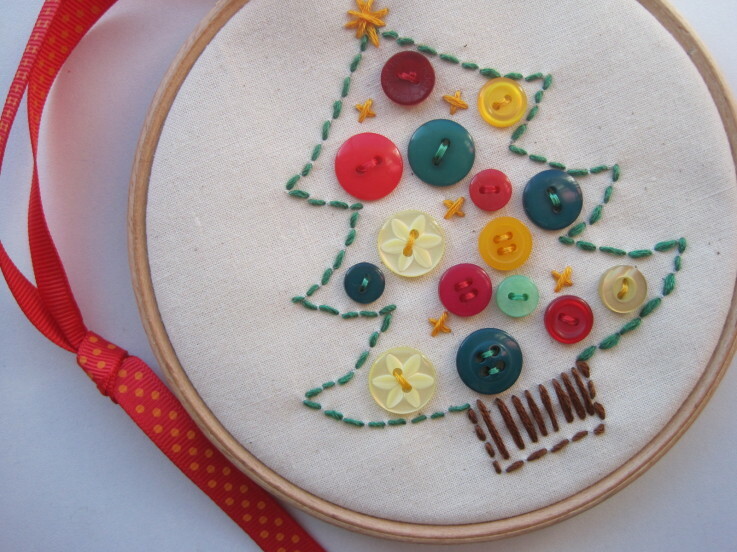 Join us to make this adorable hand sewing project just in time for the holiday season. We’ll teach you how to properly hand stitch this Christmas tree design and the button decorations. 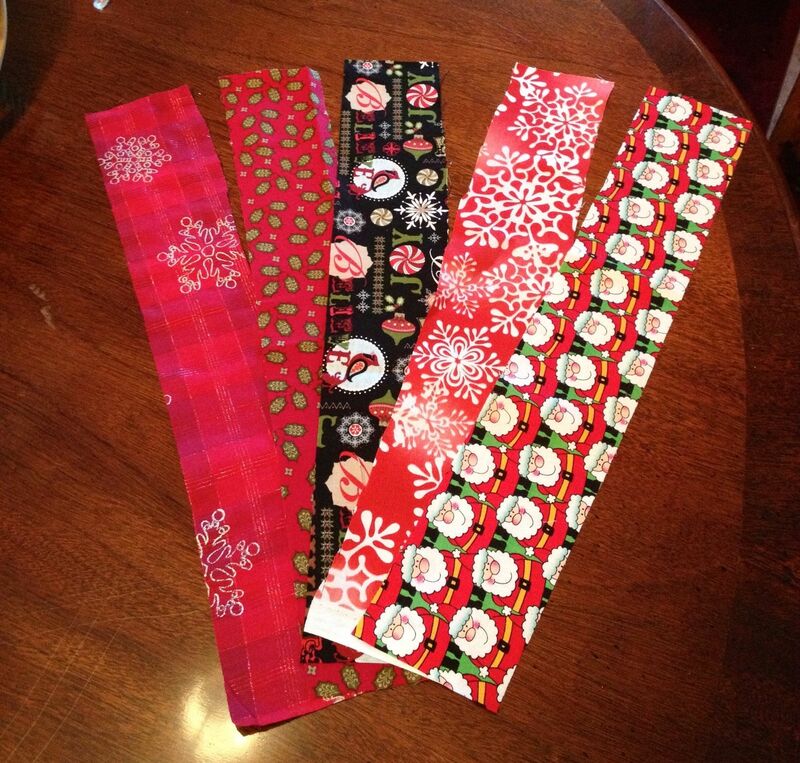 We’ll finish it up with a beautiful ribbon so you can hang it on your Christmas Tree or around your house. Supply Cost: $5 or Bring your Own Embroidery Hoop. Fabric, Thread & Buttons will be provided free of charge. 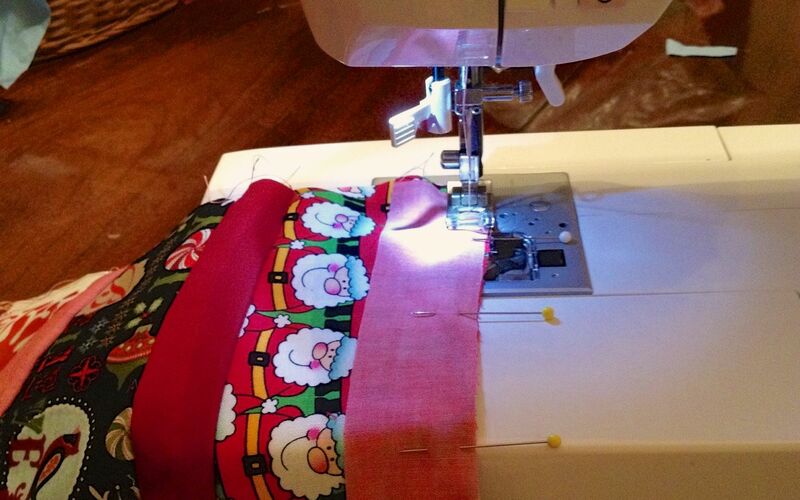 Are you looking for a sewing project that will get you in the Holiday spirit? 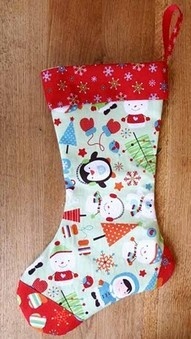 We’ll teach you how to make a custom designed Christmas Stocking. 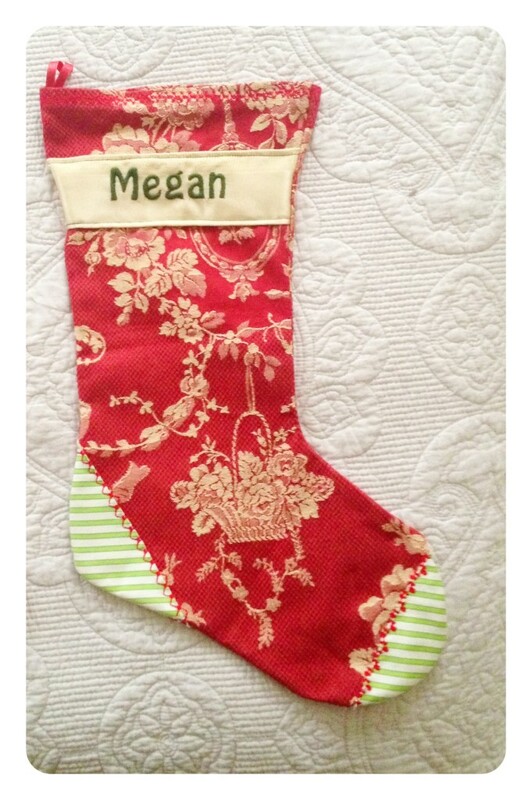 You can hang this holiday project by the chimney with care & You’ll have an adorable keepsake for years to come. Beginner stitchers are more than welcome. What will adorn your table this year for your holiday meals? This easy holiday project will look great on any Thanksgiving or Christmas table. 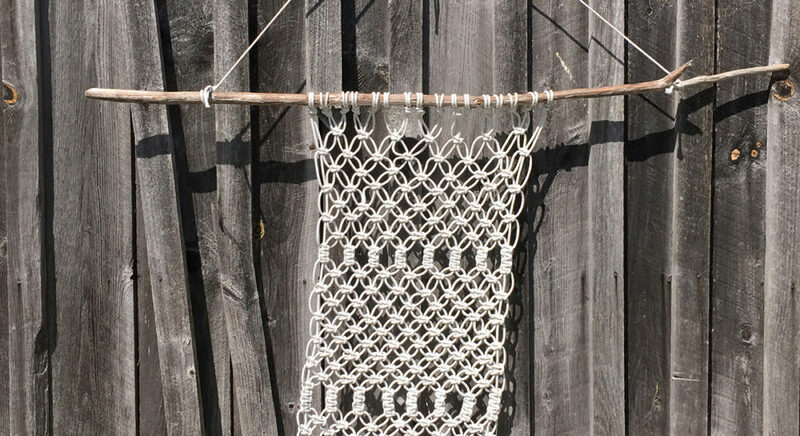 Heck – you could even just use colors to match your dining room decor and have an every day table runner. I am not a very formal person, but you can see that this runner looks cute even on my little retro yellow table. 1. 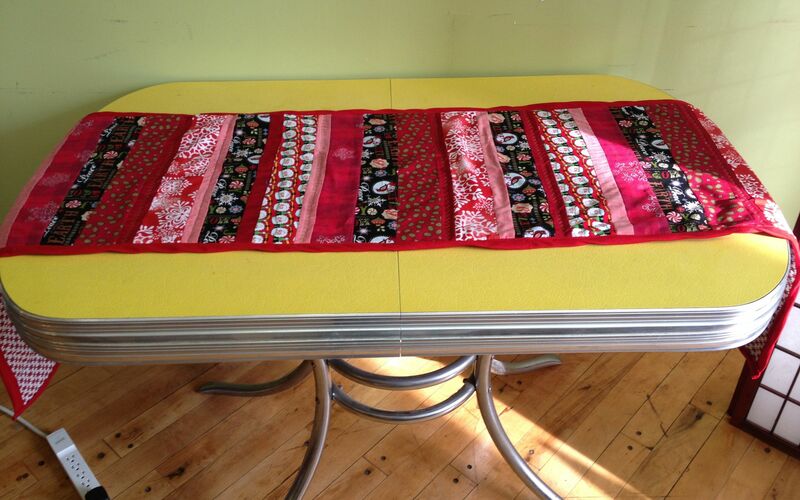 Determine the finished width & length of your table runner and what might work on your table. The runner that I made ended up being 72″ long and about 24″ wide. 2. Determine how wide you want your strips of fabric to be. Keep in mind, the thinner the strips are, the longer it’s going to take you to make the project. The one that I did above, the strips were only about 2″ wide. It took awhile to get them all sewn together, but it’s worth it in the end. 3. Figure out how many and which fabrics you’ll be using for the patchwork portion. 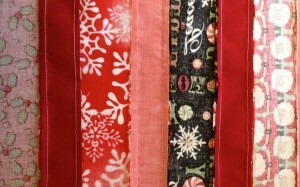 I would suggest in order not to get overwhelmed, choose 4 fabrics to repeat in your patchwork design. 4. Okay – here is where the math comes in. Ugh, I know. Divide the desired length of your runner by the desired finished width of the strips in inches + 1″ (seam allowance). So in my example with the dimensions I mention above, I would divide 72″ (finished desired length of runner by 3″ (2″ strips + 1″ for seam allowance) = 24. Do you follow? So this means that you will need 24 different strips 3″ strips to get your desired length of 72″ long. Now – Based on how many different fabrics you are using, you now divide 24 by how many fabrics you are using. In our case, the equation looks like this 24 / 4 (different fabrics). 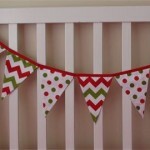 This means you will need SIX 3″ wide strips of fabrics of each of the 4 fabrics you’ve chosen for this project. Make sense? 5. Okay math is OVER. Cut out your strips of fabric based on the equations above. Arrange them in the order you’d like them to be in your runner design. 6. Start to pair up the fabric strips that are next to each other in groups of two. Pin them together with rights sides facing. 7. Sew the strip pairs together using a 1/2″ seam allowance. 8. Press opens the seams on the wrong sides. 9. Arrange the paired strips on the table in the original order you had placed them before. Pair up the paired strips with right sides facing and pin them together. 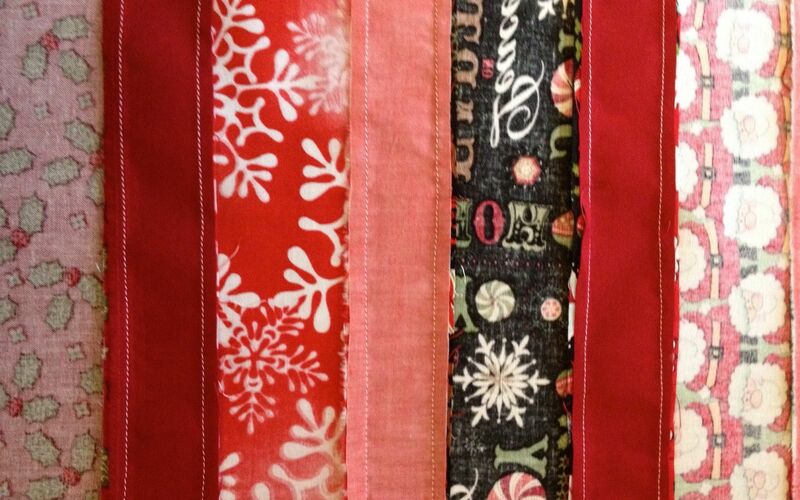 Sew the doubled strips together using a 1/2″ seam allowance. Press seams open. 11. Once you have all the strips together in the order you are happy with, iron the entire runner top again to make sure you have all the creases out. You want it nice and flat for this next step. 12. Cut the quilt batting and the fabric you will using for the back of your runner the same size as the patchworked piece. 12. 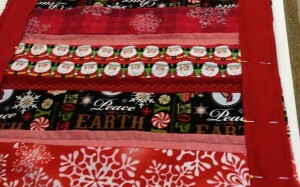 Place the patchworked piece with the wrong side down on the quilt batting and pin all the way around the edge. Then place the fabric and batting on top of the bottom fabric so the batting is touching the wrong side of the bottom fabric. You should have a quilt sandwich with the patchwork as your top bread (facing right side up). The quilt batting as your center (or filling of the sandwich). Your bottom fabric should act as the bottom bread with the right side of the fabric facing down. Now pin everything securely in place all around the edge of the runner. 13. Stitch in the ditch to “quilt” the fabric to the batting. To “Stich in the Ditch” you will topstitch over all the seams that connect the strips of fabric together. 14. Place the edge of the binding tape with the right side facing down onto the right side of the table runner. Do this along the two longer sides and cut the binding tape to be as long as the runner. Pin securely in place. 15. 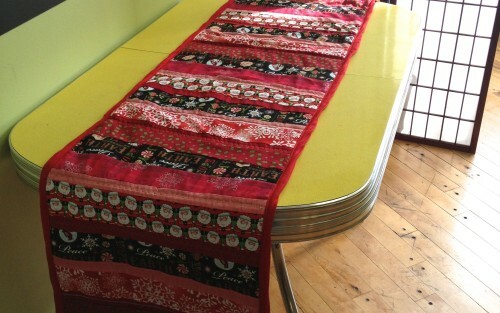 Using 1/2″ seam allowance sew the binding tape to the sides of the runner. 16. Flip the binding tape around the edge of the runner so it folds in half and wraps around the edge of the runner and pin securely in place. Do this along both the left & right side of the runner. 17. Topstitch the binding tape along the inside edges. 18. 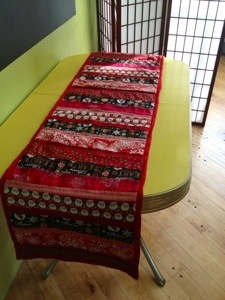 Place the edge of the binding tape with the right side facing down onto the top & bottom sides of the table runner. Be sure cut the binding tape so that it’s 1″ longer than the width of the table runner on both sides. Fold in the extra 1/2″ on each side. Pin securely in place. 17. Using 1/2″ seam allowance sew the binding to to the top and bottom of the runner. 18. Flip the binding tape around the edge of the runner so it folds in half and wraps around the edge of the runner and pin securely in place. Do this along both the top & bottom side of the runner. 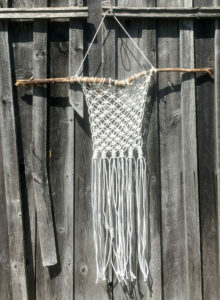 You’ll earn the title of “Hostess with the Mostess” if you wear this apron for any of your holiday shin digs this season. 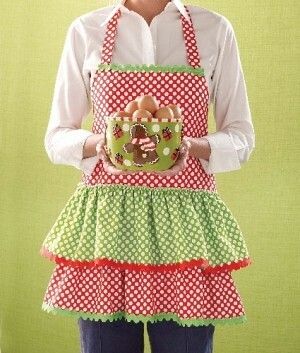 We’ll teach you how to make this full length apron adorned with two rows of ruffles. Could it get any sweeter? There’s nothing like Christmas ruffles! You’ll learn how to make rows and rows of ruffles in this holiday class. You’ll attach the ruffles into 5 rows and turn it into this circle skirt for under your tree on Christmas morning. 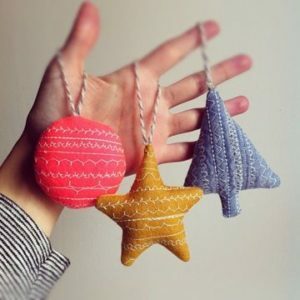 Once you learn how to make this project, you won’t wanna put any presents under the tree. 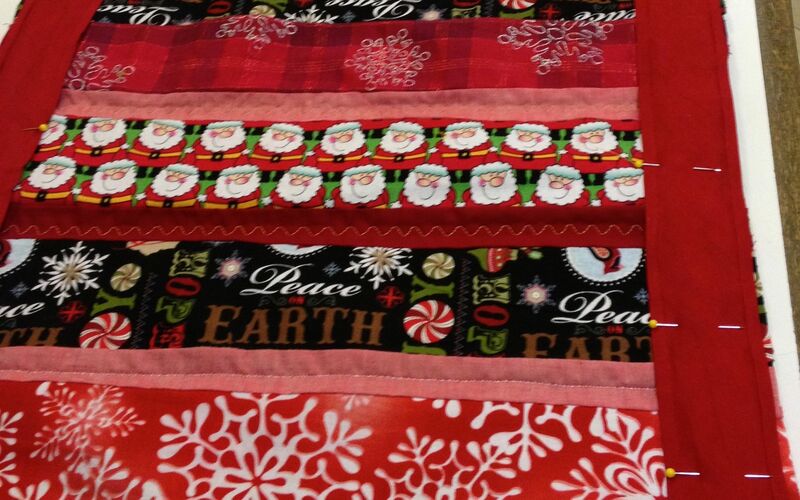 This statement of a Christmas tree skirt will look perfect all by itself.